In this lesson, students will explore how Abraham Lincoln used the power of words in speeches, letters and other documents. In the Introductory Activity, students will watch a segment from the PBS film Looking for Lincoln featuring Lincoln quotes and try to identify the origin of each quotation. In the first Learning Activity, students will closely examine Lincoln’s use of words in the Gettysburg Address and learn that a short speech can be powerful. In the second Learning Activity, students will discuss different reasons for writing letters and review some of Abraham Lincoln’s letters. In the Culminating Activity, students will write their own speeches or letters and then present them to the class. •	Describe different types of letters and reasons why people write letters. A. Identify the author or source of the historical document or narrative. C. The student understands historic figures who have exemplified values and principles of American democracy. Standard 1. Uses the general skills and strategies of the writing process. 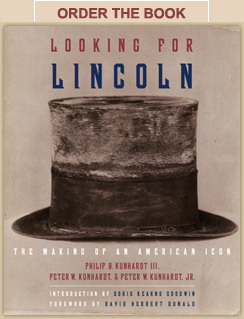 This primary source document activity helps students examine key Lincoln documents and photographs through a series of questions. In this lesson, students will be exploring the Gettysburg Address and the Letter to Grace Bedell. Bookmark the Web site used in the lesson on each computer in your classroom. Using a social bookmarking tool such as del.icio.us or diigo (or an online bookmarking utility such as portaportal) will allow you to organize all the links in a central location. Print out and make one copy of the “Famous Quotes Handout 1” for each student. Print out and make copies of the “Famous Quotes Handout 2.” Cut out the excerpts along the dotted lines. Make enough copies so that each pair of students gets one excerpt. It is fine for multiple groups to have the same excerpt. Familiarize yourself with the Gettysburg Address document featured in the Analyzing the Evidence interactive. Note: If you do not have internet access in your classroom, print out one copy of the Gettysburg Address for each student. Familiarize yourself with the Letter to Fanny McCullough, the Letter to Grace Bedell and the Letter of Thanks for White Rabbits (listed in the Web sites section above). Note: If you do not have internet access in your classroom, print out copies of each letter, so that each group of 2-3 students has one letter to review. The same letter can be distributed to multiple groups.